The first impression ballet instructor Kat Wildish gives when teaching is that she's loud, sarcastic, and wildly hilarious. But the first impression she makes when performing is different: she is pure, graceful, and wonderfully alive —rather enchanting. This December Ms. Wildish will retire from the stage dancing as the Sugar Plum Fairy, a role she has had for 31 years. In her total 40 years of diverse productions of The Nutcracker she has performed in 47 states and 12 countries. Her final bow in the Land of Sweets will be in upstate New York with the 20th Anniversary season of The Fokine Ballet Company, December 21-22. After dancing through her prime career, fighting a bitter illness, and creating a unique ballet environment by teaching, she is stepping down from Fairy reign but will continue to hold open classes at the Alvin Ailey Extension Program. "I really like being the Sugar Plum Fairy," she says. A former member of New York City Ballet and American Ballet Theater, the ballerina made her first leap into her dream role at age 17. She was invited to tour her home state of Florida with Ballet Gala, dancing alongside such legends as Rudolph Nureyev, Margo Fonteyn, Cynthia Gregory, and Fernando Bujones. "It was so cool to dance with these big stars," she recalls. Her admirable career was only just beginning. "When you achieve your dream the work is not over," she says. "It's a great responsibility. I felt worthy of it because it's what I always wanted." She has gone on to dance a variety of choreographic versions of the classic, from Balanchine, to the Bolshoi, to her most recent rendition by Michel Fokine. When asked what the best part of dancing the Fairy role is, she can't decide on any single response but rather flutters off into a series of memories. She refers to her husband of 5 years, Arthur Coopchik, and says, "The best is when he introduces me as that, as the Sugar Plum Fairy. He really loves me. People say, 'What does your wife do? Oh wow, how lovely that is.' He's such a big part of my life and that makes me proud." The role flies with her from the stage to real life, where she also expresses genuine excitement for the children involved in the production. She often carries around a bag of fairy dust backstage to sprinkle on their foreheads, "so they have my autograph." She has the ability to make everyone, from budding ballerinas to her eclectic group of adult students, feel special. To her, The Nutcracker has always been for kids and it is their amazement at the magic that brings her back each year. "To look out to the audience and see the kids looking in awe," she says, a glow in her eye, "I think that's why we all perform." Admittedly, the technical aspects of the Sugar Plum's choreography also challenge and motivate her. She works from August to December each year to prepare her strength, with a workout routine consisting of going on a "tutu diet," taking gyrotonics 4 times per week, and striving to practice the pas de deux 3 times in a row for stamina. It pays off. "After you've put in all that work in the studio and in class and on learning roles, the best part is getting out there and doing it. It's such a celebration when you get those 14 fouettes at the end." In the case of Fokine's Nutcracker, which she has performed for the last 13 years, another challenge is working with her partner, Slawomir Wozniak from the ballet of the National Opera in Warsaw. Because they are far apart during the preceding fall season, they usually do not get to rehearse as a couple until the final dress rehearsal. Their first year together, after Madame Fokine herself invited Ms. Wildish to fill the role, they only had an hour of rehearsal before going onstage. "'I was so nervous the first time there, more than any other time in my career," Ms. Wildish remembers. While she may have been lucky to dance the role of a lifetime year after year, there was a point when the Land of Sweets lost its sparkle. In the Nutcracker season of 1995 she had to be rushed to the hospital in between performances. Though she was conjuring up beauty onstage, she had been coughing up blood in the wings. Diagnosed with walking pneumonia, she finished the run of the show but had pressing symptoms afterwards. Still suffering in April of 1996, she faced a case of ulcerative colitis, a disease affecting the colon, and was hospitalized for 4 months. She was put on steroids and gained weight. The fear of not performing that season was sickening in itself. 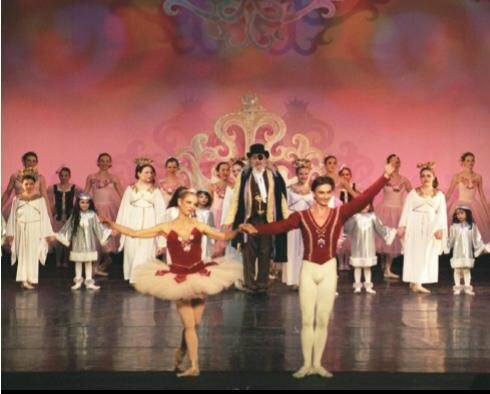 "My goal was one more Nutcracker," she whispers, fighting tears like she fought the illness. "If I could just get through one more Nutcracker…"
She began her routine to get back in shape in September, but by the time dress rehearsal came she still hadn't regained her strength to push through the entire pas de deux, variation, and coda. Nearly ready to bow out, she found encouragement from her partner and Madame Fokine. Perhaps it was the magic of The Nutcracker she constantly refers to, but somehow she discovered a way to go on with the show. "I have a meanness deep inside that comes out onstage and it came out then. I got through the first [performance] and knew I could do the rest," she says with relief. "I was invincible. But I really thought that was it." Not only did she face this feat with poise but she continued to dance the role every year until now, and she remains dedicated to passing on the beauty of the Sugar Plum Fairy. She hopes to always be involved with The Nutcracker through coaching. "Performing, and ballet in general is an obsession for perfection, and it's nice to come so close to your own perfection. It's not attainable, but it's trying to attain that perfection for others, and for yourself," which is what she now helps students to achieve. "Kat is such a fantastic teacher because she dispels all myths of ballet teachers being remotely snobby or dull. She embraces students who are willing to work hard at whatever level they are at, and she provides a disciplined, structured environment that is also extremely entertaining and vibrant," says student and friend Yasmine Lever. "She cares so much about what she does," says another student, Alice Rothman-Hicks, who has trained with her for 7 years. "She lets her students into her life and her soul, and thus gives them a window into the world of dance. She is an incredibly inspiring influence!" If there's something Ms. Wildish will miss most about performing, she says, "It's the applause. It's different when students applaud for class, but I do like giving a good class and I know [the applause is] genuine." Throughout her 34 years of teaching (16 spent at Broadway Dance Center before moving to the Ailey studios in 2007) her students have cherished and will continue to benefit from her dedication, both to the art form and to them. Her advice to aspiring Sugar Plum Fairies is to learn to "spread the magic," but if anyone has done that it is Ms. Wildish herself.